The 2007/2008 White Paper #154 Rev 1 published by APC explains “Electrical Efficiency Measurements for Data Centers”. The author points out that DCIE (Data Center Infrastructure Efficiency), defined as ‘IT Load Power’ divided by ‘Total Data Center Input Power’ is a good metric to analyse data center efficiency. 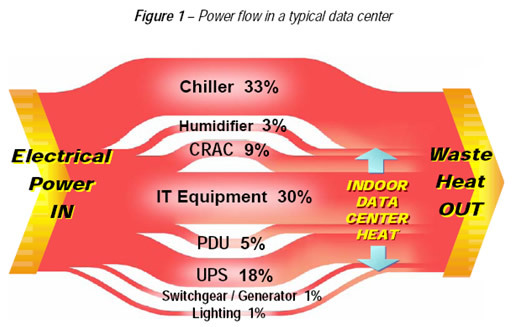 In fact, as can be seen from the Sankey diagram shown in the paper, the majority of electrical energy consumed in a data center is for cooling, UPS and other supporting infrastructure equipment. No typical DCIE is given, but the samples shown suggest that it ranges between 30 and 50 %. Several constraints have an impact on the actual DCIE, such as the IT load itself and the outside temperature, and thus should be reported along with the measurement. A nice idea to present the breakdown on electricity consumption as a Sankey diagram, rather than as a (boring?) pie chart, especially when speaking of “power flows”. Download the WP #154 from APC’s website.